Product Description The Saybolt Color test is used for quality control and product identification purposes on refined products having an ASTM Color of 0.5 or less. Products in this range include undyed motor and aviation gasolines, jet propulsion fuels, naphthas, kerosene and petroleum waxes. Color is an important quality characteristic for many products, and can also be used to detect product contamination. 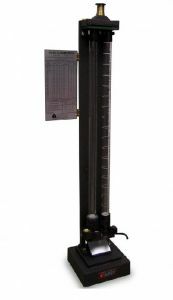 The Saybolt Chromometer measures color by comparing a column of sample against standard color discs. The Saybolt Wax Chromometer measures color of non-fluid waxes by heating the samples during the test. The Koehler K13009 Saybolt and Saybolt Wax Chromometers determines Saybolt Color of highly refined petroleum products. Consists of a matched set of sample and standard tube assemblies with optical viewer. Compares a sample of the product to be tested against standard color discs under a uniform light source. Reduce column height until the sample field is lighter than the color standard and convert height to Saybolt Color using chart on instrument. Three-position turret on standard tube permits convenient changing of color disc combinations. Accessory Daylight Lamp (Cat. No. K13010) provides standard light source per ASTM specifications. For petroleum waxes, the Saybolt Wax Chromometer (stock #N1072) is equipped with heaters to keep waxes that are not fluid at ambient temperature molten during testing. Sample tube has a 200W chrome steel strip heater and a hinged cover to maintain even heat distribution. An aluminum block heater with 50W cartridge element keeps wax molten in the draincock assembly. Accessory variable transformer may be used to regulate the sample temperature. Optical viewer and stand are fully insulated from the heaters. Sample tube assembly has heat resistant fiber handles.